These low-cut trainer socks are made with a soft, cotton blend fabric to provide everyday comfort. They feature a generous heel and toe construction to keep the socks in place and prevent slipping. 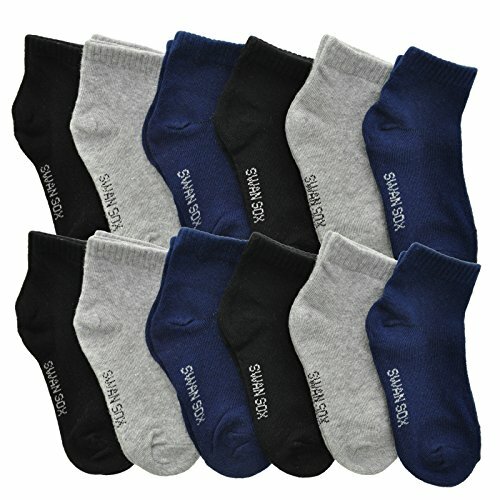 The resilient fabric retains the sock fit after every wash. - Available in a variety of colors and designs. General sizing guide: (0-12 months), (1-3 years), (4-6 years), (6-8 years), (9-11 sock size), (10-13 sock size). - Made of 75% Cotton, 20% Acrylic, and 5% Spandex. Machine wash, tumble dry low.